Jo S: Ah yes… this time last month I picked up a hunk of issue #1s and now they’re coming back for the next slice! What do all the twos add up to then? Well, I’ll see the second issue of Eugenic, to find out where this miracle-cure-turned-horror-show tale is going, and Sink #2, hoping to get a better picture of what’s going on in the dark of a rough Scottish city sink estate. I liked the revamped Ragman #1 and really loved the retro style and faded Las Vegas glam of Slots - that’s going to the end of the pack in ‘read and savour’ position. A couple of fresh starts will be glinting in the undergrowth: Sean Lewis’ work on The Few was a real standout for me this year so I’m going to try his new series Coyotes; he’s working with new artist Caitlin Yarsky, on a tale of war between wolves, the women they hunt and the detective trying to crack this mythic case. The minimal art in The Few has really made a big impression on me so hoping that Yarsky turns out to be a good foil for Lewis’ pen. 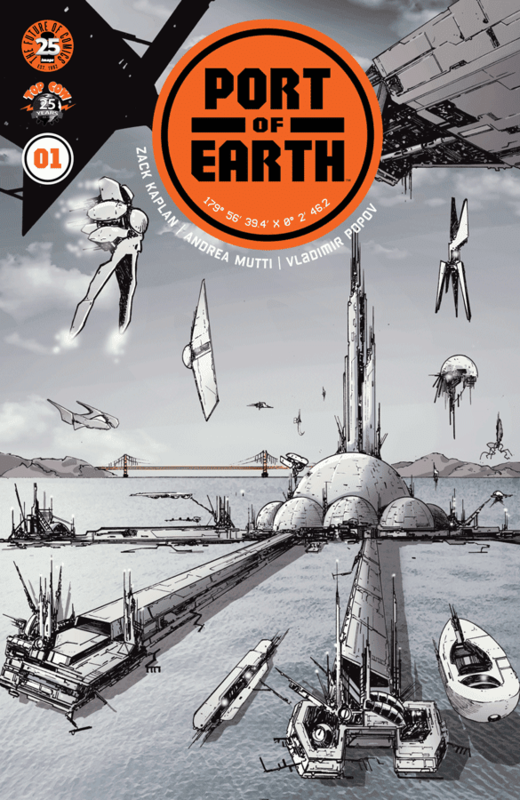 My second issue #1 is Port Of Earth, which I covered for the Shipping Forecast: I love a big ol’ dose of sci-fi and hope this one soothes the cravings. Having discovered Matt Rosenberg this year just as he was becoming Marvel’s version of Cullen Bunn (that guy’s everywhere! ), I was kicking myself for missing his 4 Kids Walk Into A Bank when it started, so will be grabbing the trade paperback with both hands. I like the way Rosenberg ticks; his timing and wit are second to none for me currently and, since this seems to be the work he’s most proud of, it seems only respectful to indulge.